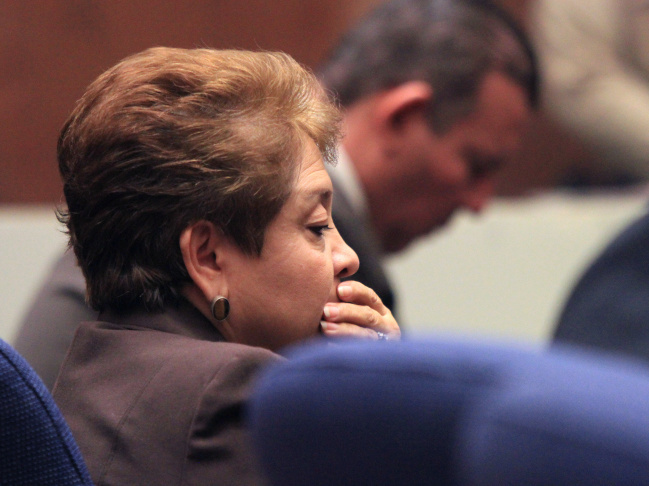 File photo: Teresa Jacobo, one of five former Bell City Council members caught up in a massive corruption scandal, is found guilty of stealing public money March 20, 2013 in Los Angeles, California. On Friday, July 25, 2014, she was sentenced to two years in state prison. Two other ex-council members have yet to sentenced. 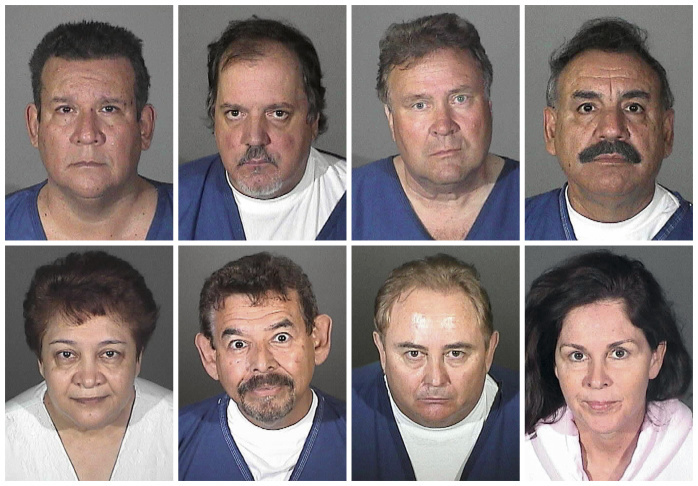 This combo made with booking photos provided by the Los Angeles County Sheriff's Department shows from top left, Luis Artiga, Victor Bello, George Cole, and Oscar Hernandez; from bottom left, Teresa Jacobo, George Mirabal, Robert Rizzo, and Peir'Angela Spaccia. 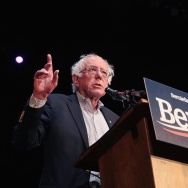 The eight were charged with taking more than $5.5 million from the working-class suburb of Bell, Calif. in a scandal that triggered nationwide outrage and calls for more transparency in government. Former Bell City Councilwoman Teresa Jacobo was sentenced to two years in prison on Friday for misappropriating public funds in the massive public corruption scandal that rocked the small city in southeast Los Angeles County, according to information from the District Attorney's office. Jacobo, the third ex-council member to be sentenced this month, was accused of inflating her salaries for creating sham boards that rarely met, or met only for a few minutes at a time, the D.A. 's office said in a statement. This was despite two of her co-defendants receiving primarily probation for similar offenses. Two other council members have yet to be sentenced. The sentencing for Oscar Hernandez will be July 31, and for Victor Bello, Aug. 1. The five council members were together convicted of stealing a total of nearly $1 million, according to the D.A. 's office. Why is public corruption endemic in southeast L.A. County?